The A4P-Series Wafer Resistivity Mappers use proven industry standards to provide fast, accurate and reliable measurements of sample resistivity distribution. 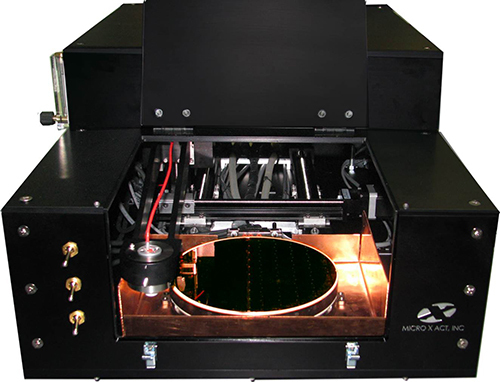 MicroXact’s four-point probes measure the average resistance of semiconductor wafers of layers by passing current through the outside points of a four-point probe and measuring the voltage across the inside points. The value of resistivity, the property of the material giving it electrical resistance, can then be found by multiplying sheet resistance by the thickness of a film. Offered as a 100mm, 150mm, 200mm, or 300mm system, the A4P four-point probe is designed to be maintenance-free and very easy to use. A variety of options are available for this system, including wide-range thermal testing, custom chucks for non-standard materials and 4-point probes customized for nearly any application. The A4P-200-PLUS automation software permits semi-automated or fully automated testing with the resistivity mapping system. The Interface is designed to be simple yet powerful, allowing users to easily set up an automated testing procedure for nearly any kind of wafer structure. The LabView-based software is logically structured and allows for easy integration of the customer’s own test and measurement equipment. The software can be installed on any PC with Windows XP or higher operating system. Systems provide fast, accurate measurements and are very user friendly. Intuitive LabView-based open-source software offers a variety of data processing options as well as 2-D and 3-D mapping of results. Wide range of materials and structures that can be characterized. Wide resistivity measurement and sheet resistance ranges. Temperature range: from less than -60°C to over 300°C. 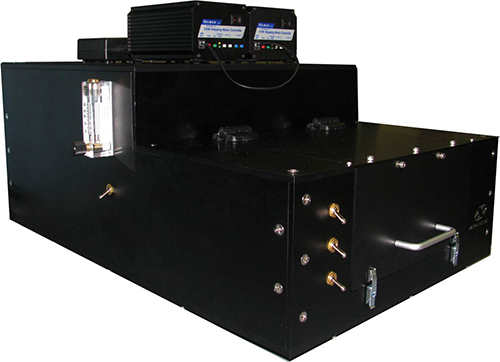 Selectable 1-, 5-, 9-, 25-, 49-, or 121-point measurement modes as well as custom resistivity measurement modes. Adjustable vacuum chucks accommodate sample sizes ranging from 5mm to up to 300mm. Fast measurement mode in either ASTM, SEMI or simple output. 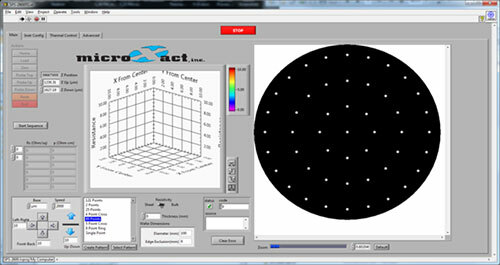 Point & click or direct coordinate entry for wafer navigation. Compatible with Jandel probe heads. Vacuum or controlled environment version of the system is available for resistivity testing at extended temperature testing. In most cases, all automation, measurement and data acquisition can be managed by the software package running on a simple laptop computer. No expensive hardware is needed. Software allows user to generate a measurement pattern map. Software allows user to generate 2D and 3D maps of results. Software outputs resistance & resistivity or thickness measurements. Full control of the thermal chuck is built into the software permitting complex and highly customizable testing sequences. The software is open source and the customer can customize it to fit any specific needs. MicroXact team works diligently with customers to develop the best possible automation solutions as quickly as possible. The following specifications are for a standard configuration. In most cases, each A4P 4-Point Probe system can be customized to exceed these values.